My husband will NOT eat salsa (even the mild kind) and I really dislike boiled chicken. I'd love some other suggestions. TIA. Your chicken should not have more than 75mg of sodium per serving, if it does, it has been injected with sodium!! I don't understand why even chicken has to be messed with by meat companies! @Yvonne - oops - I think they are 15 ounces - large jar of salsa - I will check and add it in the recipe. I do this all the time! My fiance calls it "Maria Chicken." I adapted the recipe from a friend. I do one or two breasts of chicken, a bag of organic frozen corn, a jar of salsa and fresh diced tomatoes (not from a can). I serve it similar to you, but my fiance likes it over brown rice! How much does one serving measure out to be? Also, the recipe does not include the tortilla therefore, I am assuming the point count will be higher than 3...is that accurate? Thank you for this great sounding yummy! I've only done this in conventional oven, not microwave, because it needs a bit of time for the flavors to blend. I've cooked this for company before. You could use stuffing but higher calories/carbs. Maybe try in convection oven, just reduce cooking time. 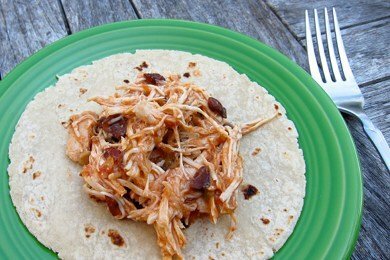 I love making salsa chicken in the slow cooker. Another trick for juicy chicken breasts is to pound them to an even thickness so they cook more evenly and are less likely to dry out. One of my favorite ways to prepare them is to sprinkle them with lemon pepper. Cook in a skillet on top of the stove just until done and then drizzle them with fresh lemon juice. I got this idea from an Ellie Krieger book, where she says she learned it from Mark Bittman. I made this tonight and added yellow and orange bell peppers and zucchini and it was really moist and tasty! My husband and kids like it also and that doesn't happen often. Has any one realized Reynolds makes a liner for that crockpot - no more cleaning the pot except for possibly wiping out the condensation! House people, we have been set free! Okay, so I've seen a similar recipe to this before. Do you have any other suggestions on what to use when you aren't feeling like Mexican? What other liquids would work? Thanks! Also, any variations for pork? My husband is allergic to chicken. I got your message regarding what other liquids other then salsa? You can try Teriyaki. Also try Italian/Ranch/Caesar salad dressing! Also try apple & pineapple juice as well.And if you like smaoked food as well, try a few shots of liquid smoke! Tried it but the chicken kept jumping out of the crock pot. This is my favorite way to cook chicken breasts. I sent this recipe to my husband, and he made it last night (which of course made it 100% better!). The chicken was fantastic. He mixed a really good chunky salsa (not as much liquid) with some Pace salsa (which had more liquid), and added some Adobo and taco seasoning. It smelled just as good as it tasted! Highly recommend it! I marinate boneless and skinless chicken breasts for about an hour then cook them for about 4 minutes on a George Foreman grill. They come out juicy and perfect every time. I'm not a gadget person....but this grill is amazing. Best purchase ever. It grills lots of things besides chicken...onions, portobello mushrooms.....dinner in a snap. Not to be contradictory, but your assertion that chicken breast is a tough meat and NEEDS to be tenderized with slow cooking is just.. wrong. Slow cooking is great (and easy) as this tasty recipe illustrates, but there is absolutely NO reason why anyone with a little oil/butter, salt, pepper and a thick frying pan (can't say enough good things about cast iron!) can't make the juiciest chicken you've ever tasted in under 20 minutes. Wonderful site, he takes the mystery out of cooking delicious, juicy cuts of meat without the need for marinades or flavoring. I am making this tomorrow with Newmans black bean and corn salsa.